For any screen that allows you to fill in fields, the Save All action is used to validate and save the data to the table. This is usually executed by a save button on the screen. 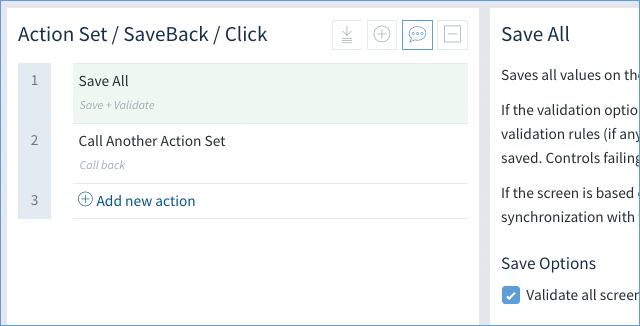 In the above image, a Save & Back button has these two actions within its Click event. The Save All action will save the fields on the screen to a record within the base table of the screen. If the Screen Active Record ID is not set, then the Save All action will create a new record (insert a record) in the base table of the screen. If the Screen Active Record ID is set, then the Save All action will update the record as specified by the Record ID stored in the Screen Active Record ID. In the case that the base table is a QuickBooks table, Method will then perform a real-time synchronization with your accounting software. 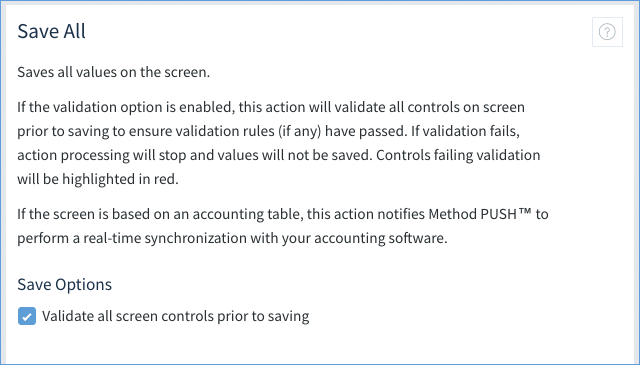 If there are any validations on any of the fields, then the checkbox Validate all screen controls prior to saving will do just that.